WE’RE. NOT. WORTHY! Grand Cru, 91-POINT, 100% organic, single-vinyard, electrifying, epiphany-causing, captivating Alsatian brilliance from a property dating back to the 16th century (! ), literally UNOBTAINABLE in the USA (that’s why we go there every year, to dig these treasures up!!)! Oh BABY! This is the real-deal, Grand Cru Riesling from northern France, in Alsace near the Vosges mountain range. The vineyards are spectacular --- and ANCIENT. Check out this drone video to get a sense of the awesomeness. We discovered Jean Marc’s fantastic, crisp, tangy and crazily complex wines last year during a mad 24 hours in Alsace. Upon tasting, we immediately bought anything he would sell us (most of the Grand Crus are in super-small quantities) --- so...please, especially with our wicked-low price today, we must insist that you try this. Even better, try it with a “flammekuche” like we did (a typical thin flatbread pizza with cream, onions and bacon, nothing wrong with that!!). Goodness, we’re gettin’ sweaty just thinking about it. So good. MMM! SO --- the noble Riesling from this magical vineyard is made in a dryer style than what you might typically get in Germany (also, modest alcohol at 12-13%). Not quite bone-dry, but close -- it SOARS with apple fruit, apple skin, Meyer lemon, and sour candy flavors, oh-so cool, invigorating, minerally, brisk and uber-fresh. Thrilling, yes yes. The finish is amazing. So long. This is FANTASTIC with Thanksgiving food, we might add --- well, you get the idea, sorry to go on so long!! Very little to go around! The pure granite of this steep sloping Grand Cru vineyard with its sun-drenched southern exposure are the building blocks of this sites greatness. You flipped for the 2015 and we sold out in minutes. Grab the 2016 for it disappears for good! 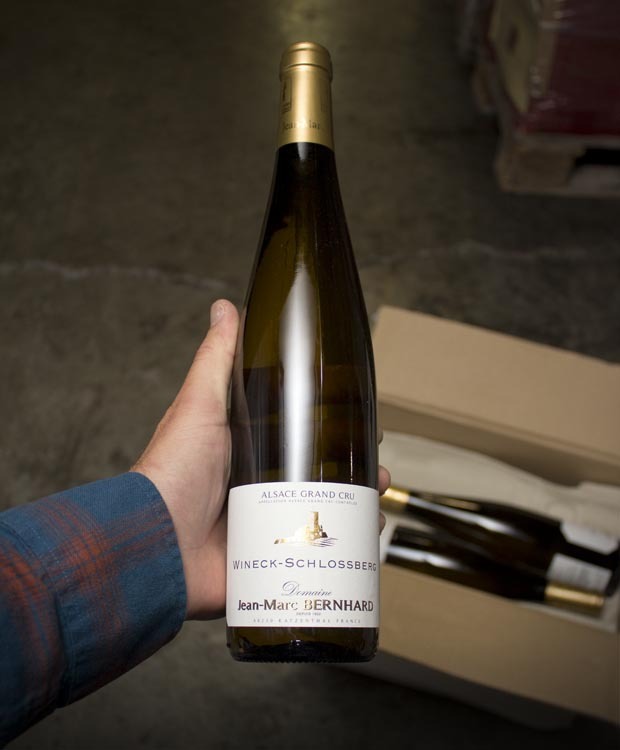 Domaine Bernhard is a small, family-owned wine estate in the foothills of the Vosges Mountains, directly west of Colmar in the little burg of Katzenthal. In 16th century buildings on an estate they purchased in 1802, the family creates provocative, even exemplary Riesling, Pinot Gris and Gewurztraminer. From granite-based soils, these wines are crisp, clean, fruity and fragrant, and very well balanced with slightly lower alcohol levels (12- 13%) than their neighbors to the south. Beginning in 2012, all Bernhard wines will be certified organic. Everything here is done to promote the life of the soil which is the root of expression for each terroir: regular plowing, grass in the vineyard, compost, maintenance of old-to-ancient vines, only the most detailed and precise attendance to viticulture. The 9th wine making generation of the Bernhard family currently operates the estate.